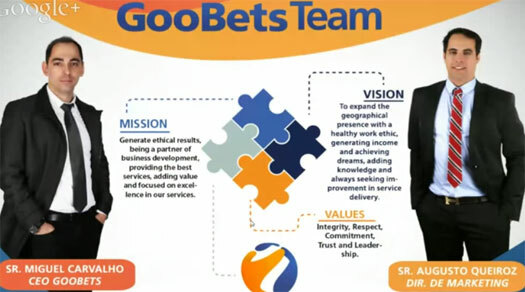 There is no information on the GooBets website indicating who owns or runs the business. The GooBets website domain (“goobets.com”) was registered on the 15th of August 2014, listing a “Pedro Barbosa Filho” of “GooBets LLC” as the owner. An address in the UK is also provided. I was unable to find any further information on Filho in relation to GooBets. His relationship with the company remains unclear. Further research meanwhile reveals multiple businesses operating out of the provided UK address, suggesting that GooBets exists in the UK in name only. Additional evidence supporting this is the fact that the email address used to register GooBets uses a Brazilian domain. The name of the domain owner, the Brazilian email address used to register the domain and the fact that only Portuguese and English are offered as languages on the GooBets website, strongly indicate the company is being run out Portugal or Brazil. Of those two, Portugal is the likely candidate, with Alexa estimating that Portugal makes up 19.3% of all traffic to the GooBets website domain. Peru (18.8%) and India (17.8%) round out the top three sources of traffic. GooBets has what appears to be an official company YouTube channel. 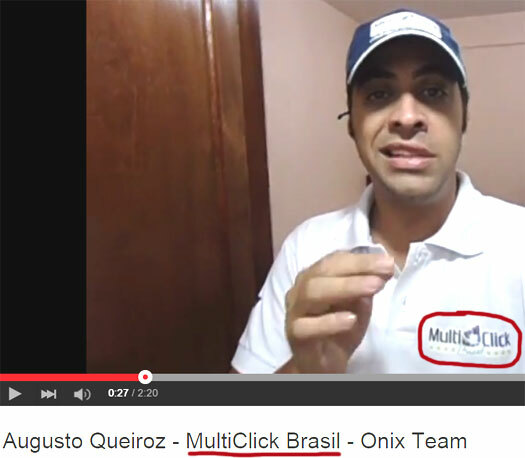 In videos uploaded to the channel, a “Miguel Carvalo” is credited as the CEO of the company. 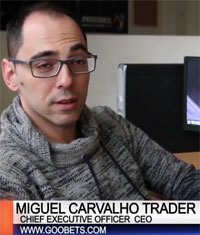 Miguel Carvalho is a famous Portuguese trader. His administrative competence and sports prognosis market experience were fundamentals to achieve Goobets Main Trader position. He started at the trader world in 2004 and since then he is increasing his fame and market recognition. For reasons unknown, Carvalho is not credited as GooBet’s CEO on their website. Carvalho being based out of Portugal meanwhile further re-enforces that this is likely where the company is based. Finally, as far as I can tell, GooBets is Carvalho’s first MLM venture. Someone you won’t find mentioned on the GooBets website is Augusto Queiroz. Not surprisingly, given Miguel Carvalho’s evident lack of experience, Queiroz is the driving force behind the MLM side of GooBets. MultiClick was a Brazilian Ponzi scheme, shut down by regulators in late 2013. Read on for a full review of the GooBets MLM business opportunity. 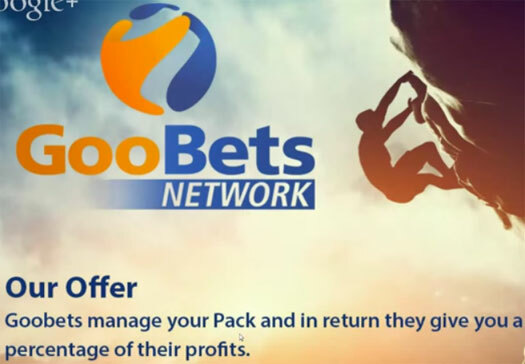 Once signed up, GooBets affiliates can then invest in Bet Trader packs (310-$1350) and participate in the GooBets income opportunity. Bundled with GooBets affiliate membership are various amounts of betting tips each month. These betting tips are focused on the sporting events. The GooBets compensation plan sees affiliates sign up, pay a membership fee and then recruit others who do the same. These percentage amounts correspond to the total amount of funds invested, with what is actually paid out being a floating percentage. will lose your participation bonus when you receive 2 times the amount of your pack from your network commissions. This suggests that ROI payments cease once 200% of the amount invested has been paid out via non-ROI commissions. GooBets affiliates are paid to recruit new investors who invest in the scheme. Residual recruitment commissions are paid out using a unilevel compensation structure. GooBets cap payable unilevel levels at ten, with a 0.22% commission paid out on any investments made between levels 2 to 10 (level 1 commissions are paid out as above). Residual Commissions in GoodBets are paid out using a binary compensation structure. These first two positions represent the start of two binary teams (left and right), with positions filled via direct and indirect recruitment of affiliates. Note that the first two positions in the binary do not generate any points. An affiliate must first recruit two affiliates (to fill these two initial positions), in order to qualify for binary commissions. Points on either side of the binary are tallied up daily. GooBets affiliates are then paid up to 50% of the point total of their weaker binary side (the side that generated the least points). Points paid out on on both side are then flushed, with the weaker side reset to zero and points leftover on the stronger side carried over to the next day. Note that points eventually expire 60 days after they were first generated. 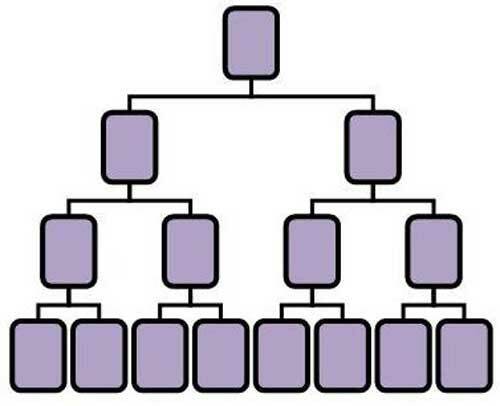 Using the binary compensation structure explained above, GooBets pay a referral commission using monthly affiliate fees. At the end of each day, points are tallied up between the two binary sides, with commissions paid out at a rate of 1 point matched equal to $1. In order to qualify for the Green Diamond Bonus, a GooBets affiliate must recruit at least ten Bet Trader IV investors. Five of these investors must be on the left side of the binary and five on the right. GooBets affiliates have 60 days to meet this qualification criteria, from the date they first signed up as an affiliate. If an affiliate meets the above qualification criteria, they receive a share of 2% of the funds invested in GooBets each month. The Black Diamond Pool is made up of 1% of the funds invested in GooBets each month. Shares are distributed equally among qualified affiliates, with affiliate qualifying by generating at least 3000 binary points on both sides of the binary. This daily qualification requirement must be met for at least 20 days in any given month. Note that this is an ongoing monthly requirement. GooBets affiliates are given various bonuses, based on how many binary points they’ve accumulated on their weaker side. The primary difference between these membership options is income potential via the Goobets compensation plan. Augusto Queiroz’s MultiClick Ponzi experience is on display here, with GooBets offering up more of the same. Before we get into the sports betting ruse, a simple glance at the GooBets compensation plan reveals that affiliates invest large sums of money on the promise of a weekly ROI. The MLM side of the business seeks to dampen the funds paid out via ROIs, dragging GooBets into Ponzi / pyramid scheme hybrid territory. Either way, it’s painfully obvious that funds paid out are primarily sourced from new affiliate investment. There’s also an additional “pay to play” element to the scheme, with income potential tied to how much is invested. This is evidenced in the binary earnings cap, percentage of binary points paid out on, referral commissions cap and weekly ROIs paid out. Affiliates are also capped to investing in one pack, unless they invest in a Bet Trader IV pack. Upon handing over $1350, Goobets affiliates are then able to invest in up to nine additional Bet Trader IV packs. And this brings us to GooBets sports bet ruse. First and foremost, if Miguel Carvalho had indeed developed some crackpot betting method to sustain 200% ROI payouts – what on Earth does he need your money for then? Surely he’d be able to take a loan out from a bank, double it, pay the loan back and then be well on his way to generating a fortune? The reason Carvalho and GooBets need affiliate investment is obvious: They’re running a Ponzi scheme and need the funds to pay out existing investors. No doubt some token level of sports betting activity goes on, but I’d wager it wouldn’t be anything less than one to two percent of funds invested. Between the MLM commission payouts and weekly ROIs, there simply isn’t enough funds to risk on sports bets. Further evidence of a Ponzi scheme can be observed by way of comparison between the nature of betting (no guarantees), and the commissions and ROIs GooBets pay out. There is a complete disconnect between the two, all but revealing the only constant GooBets rely on is new affiliate investment. Oh and did I mention one of the ringleaders was involved in one of the biggest Ponzi schemes in Brazil only recently? That alone should be enough to trigger fraud alarm bells. As with all Ponzi schemes once new affiliate investment dries up GooBets will find itself unable to meet it’s weekly ROI obligations. Seeing as passive investment is entirely possible (GooBets are of course illegally engaged in the offering of unregistered securities), those investors are likely to see the warnings signs first emerge. This will manifest itself by way of a reduction in the weekly ROI paid out. That’s around the time those participating in the MLM side of the business will notice binary points generated declining. By then of course it’ll be too late, with Miguel Carvalho and Augusto Queiroz making off with what’s left (I have a strong suspicion there’s other serial Brazilian and Portuguese Ponzi pimps involved in this one too). Ponzi regulation in Portugal is rather lax, so don’t expect intervention anytime soon. Rather, GooBets is likely to collapse – which unfortunately causes the most amount of destruction to investors. Goobets company was registered in the UK as a Limited Liability Partnership (LLP, ltd) 10/15/2014.Operational office of the company is located in Lisbon, Portugal, that is where all the work is carried out related to the web site, as well as the administration is there to help support Partners. also, goobetters, while selling their wares on the net, rely heavily on the name of one ‘billy walters’, who is an infamous sports bettor, and was profiled on 60 minutes. there is absolutely No Connection between goobets and billy walters, but his name and mugshot is used everywhere, as though he has something to do with goobets! i guess using billy walter’s name for free, helps to impress newbies, about the seriousness of goobets ‘sporting bets’. How many traders employ GooBets company? The company employs 54 GooBets traders, who for seven days a week for us to generate the profits. well, how come they can exactly tell you the number of people they ’employ for betting’, but wont tell you the address where these employed people work from? Saying that the operational office is in lisbon, portugal, is a ‘very wide description’, i would say! Sexta às 9, the investigative journalism program that blew open the GetEasy scam also did a profile on it on the 10th of April. They also kept using the image of a known portuguese trader, Paulo Rebelo, portraying him as a supporter of the GooBets scam. He told the reporter that he thought it was a clear pyramid scam, didn’t beat around the bush about it. Miguel Carvalho also left his CEO position just a day before the piece aired. It clearly signs the beginning of the end. But when one ponzi goes, two more rise up and take its place. BNG International (former Wishclub) is still going strong and GetEasy reload scams like Empire MLM (just Facebook it) keep preying on the greed. I can also add my ideas that this one is being run out from Portugal. I first got notice when they did their launch presentation in Portugal. I suspect this was one of the side effects from GetEasy. I have no solid evidence but…. I think these were people who were inside GetEasy. I take this from the very suspicious timming. GooBets was first advertised in Lisbon at the same time GetEasy was missing payments and debunked on the news. Its a guess but I would say these were people who have been connected to Ponzi Activity in Portugal for years! And they were just one of the new schemes being born when GetEasy crashed. This makes more and more sense when you see people like Tiago Fontoura being a close connection to these guys…. They are bit low profile compared to Tiago, but no doubt they are Ponzi pimps who have probably been active for years and just now showed up as top leaders on their own scheme. Hi Teammates ,Terry here … I’ll make this real quick. I just joined this brand new opportunity recently & we are all making money. I’m sharing this one as it’s brand new… TOTALLY UNIQUE and the easy Passive Income is already grabbing peoples attention. There is so much VALUE and potential to this business that it’s taken me over a week to check it out and test it for myself. Earn up to 30% Every Week – in Passive Income alone. This business launched in Portugal and is now spreading like wild fire across the English speaking world. This isn’t the “next big thing”….. this is going to be the ONLY THING !! # Want To Earn 100% Passive Income ? # Want To Make $4,000 per month in Passive Income ? # Want To Make $40,000 per year in Passive Income ? NO POINTLESS TASKS….. EVER !! Click on the link below and see how Everyone IS and WILL make money. AND click on the GET ME STARTED button. Every single person makes money…. Don’t watch others make a fortune here, take action now. I believe this to be one of the most exciting launches this year. This launched in late 2014, he’s a bit late to the party. Aniceto Rui: Miguel Carvalho also left his CEO position just a day before the piece aired. It clearly signs the beginning of the end. @scamerssuk make sure terry burns knows that the Brand New scheme he just joined is a headless chicken in the throes of death. How can everyone make money and not recruit? I’ve been told about this. One thing I didn’t like was 1. The recruiting thing, and 2. A level package costs about $300, yet you make about $12 a week. It’s nothing really. I thought this looked a good thing when I got told about learning you trade betting, but now it makes me wonder, unsure. I don’t know much about GooBets, but as soon as I saw Darren Barton promoting it, I knew to steer clear. He who brought thousands into Tracy Davison’s Penny Matrix downline, and then Spinding. Everyone lost a heap of money. Best to stay clear of these ponzi pimps. Oz, Fernando Augusto is the owner of the company and became very angry with me when I asked him about what he thinks about the statement, Iin Portugal, DECO and Anaon on your Goobets company. Came to tell me that the legal department of the company will be getting in touch with me kkkk. Serial Ponzi scammer knows how to lawyer up? Well I never! Not another scam: Who is Darren Barton? As far as I could see, they launched around 10/2014 or 11/2014. They are still on an early age and they could be expanding. They launched exactly when GetEasy started to miss payments. I remember sending an sms to a friend of mine just to give an example of another Ponzi which was just starting in Lisbon. So far, despite Portugal doing very few on the legal field, everything is leaking to the news fast. It seems to be the adopted strategy: Leak info to the news and allow it to become public. If they keep going, just wait to see how hard it will get for them to conduct banking operations inside EU. Expect some warnings from Central Banks in the near future. This sounds like BeWise Trader which a colleague has been trying to get me to sign up too. Anyone know if its related? I’ve also been invited to be wise trader and have to say it’s appealing but sounds too good to be true. What little I know about the bet trading is you can make big bucks but it’s gambling and not full proof. I had a look around in the private group on Facebook and everyone is super nice to entice more people in. How long do these sort scams normally last? Reviews and word mouth will kill them sooner rather than later because no one will join? How long do these sort scams normally last? Until new investors stop pumping funds into the scheme.